paneer curry recipe - this is a rich and delicious cottage cheese curry made in an onion-tomato-cashew base. 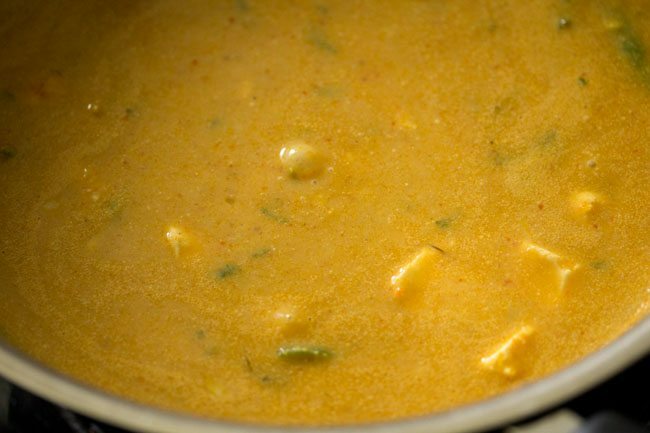 paneer curry recipe with step by step photos – a rich and delicious cottage cheese curry made in an onion-tomato-cashew base. i prepare this paneer masala recipe at times. so thought of sharing the recipe. 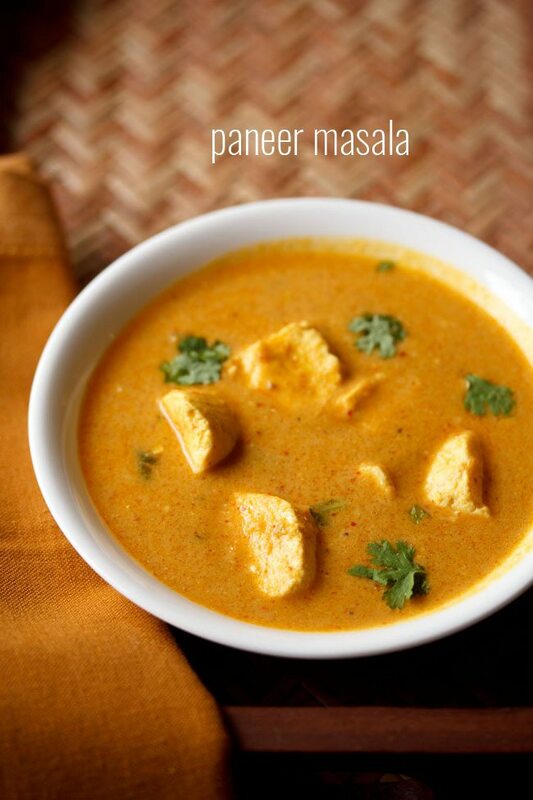 this recipe of paneer masala is very different from the paneer butter masala recipe i have posted earlier. 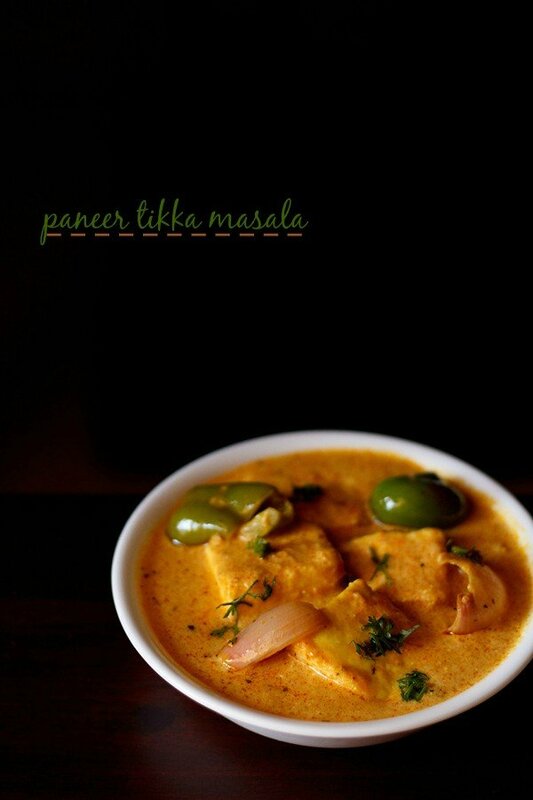 addition of onion paste does make a difference to the overall taste and flavor of the paneer curry and it taste good. a few more spices are also added in this recipe which adds their own aroma and flavor. 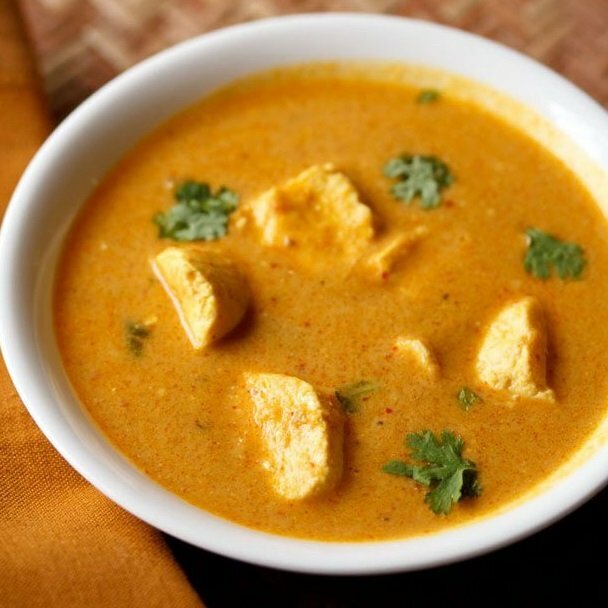 in indian restaurants, many paneer curry recipes are served and this is one such popular recipe in the restaurants’ menu. while making paneer recipes, i make paneer at home. homemade paneer is better any day than store brought ones. 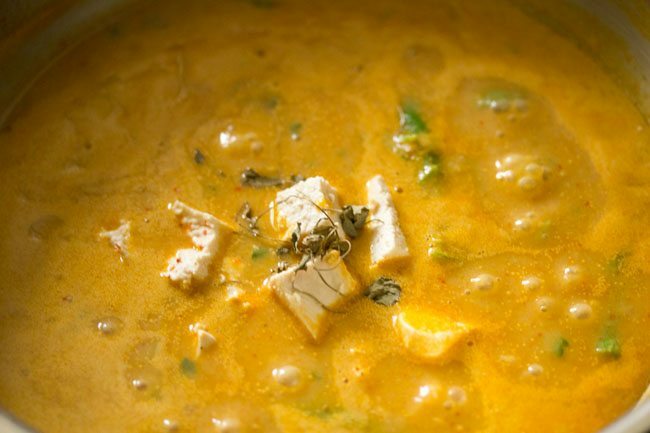 instead of paneer, you can also use tofu in this recipe. along with paneer, you can also add some steamed green peas and potatoes in the recipe. since tomatoes are added in the recipe, do use ripe red tomatoes with are less sour and have faint sweet taste in them. avoid using tomatoes which are too sour as this will ruin the taste of the gravy. 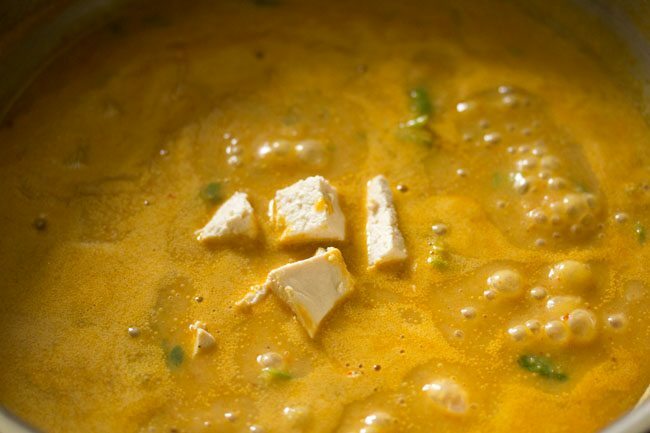 paneer curry is best served with chapatis, rotis or naan. you can also serve this cottage cheese curry with plain rice or jeera rice or masala rice or biryani rice. first soak 12 to 15 cashews in hot water for 30 minutes. when the cashews are soaking, roughly chop 2 large tomatoes, 1 large onion, 1 inch ginger and 6 to 7 small to medium garlic cloves. 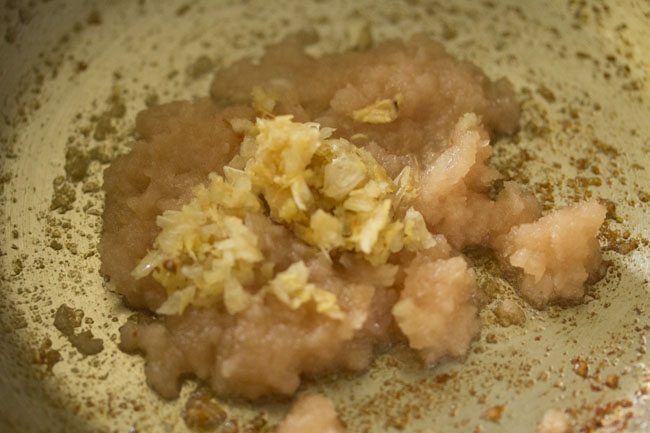 crush the ginger and garlic to a paste in mortar-pestle. in a blender jar or grinder jar, take the chopped onions. without adding any water grind to a smooth paste. remove the onion paste in a bowl and keep aside. to the same grinder jar, add chopped tomatoes. also add the soaked cashews. 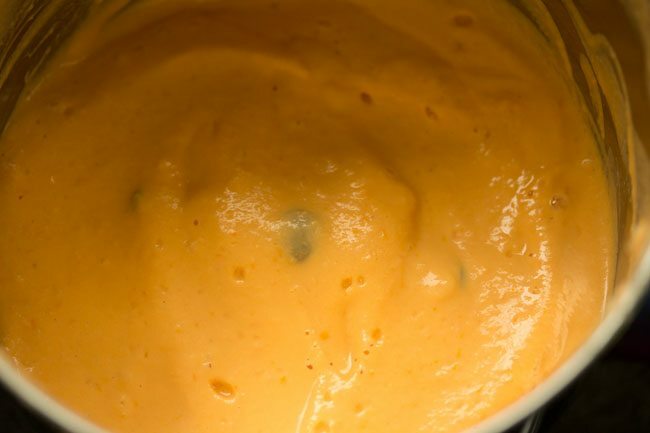 again without adding any water, grind both tomatoes and cashews to a smooth paste. keep the jar aside. heat 3 tablespoons oil in a thick bottomed pan or kadai. on a low flame begin to saute the onion paste. keep on stirring often while sauteing the onion paste. saute till the onion paste becomes light golden or golden. then add the crushed ginger-garlic paste. 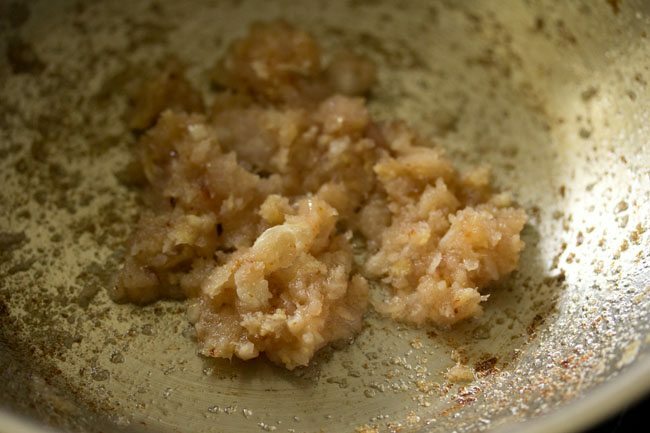 if using ready ginger-garlic paste, then add 1 teaspoon of it. now add the tomato+cashew paste. be careful as the mixture can splutter. mix everything very well and begin to saute the masala on a low flame. while the masala is getting sauteed, add 1.5 cups water in the grinder jar. swirl the jar so that the tomato paste at the sides and at the bottom get mixed with the water. if you want you can even run the mixer once, so that everything gets mixed well. keep aside. saute the onion-tomato masala till you see some fat releasing from the sides. the masala will also become glossy. 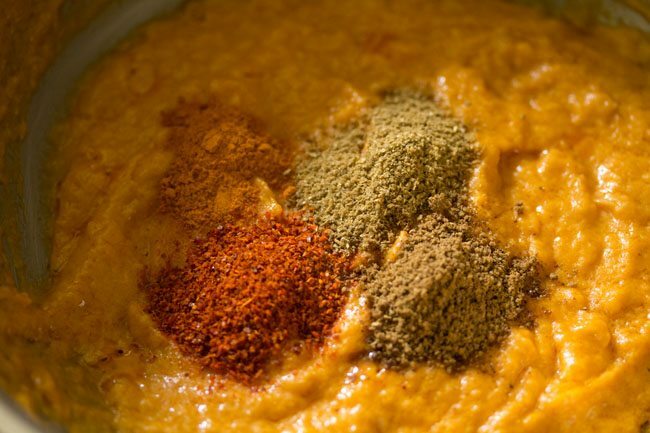 then add ¼ teaspoon turmeric powder, ½ teaspoon red chilli powder, ½ teaspoon coriander powder and ½ teaspoon garam masala powder. add the water which was mixed with the leftover tomato+cashew paste in grinder jar. season with salt. also add 1 tablespoon chopped coriander leaves. 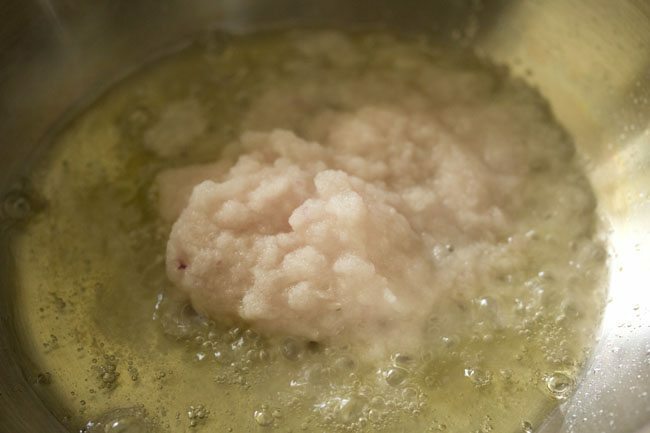 on a low to medium flame, simmer the cottage cheese curry till it thickens a bit and you see oil specks on top. add ½ teaspoon kasuri methi, which has been crushed. mix well and cook for a minute. then add 2 tablespoons low fat cream. 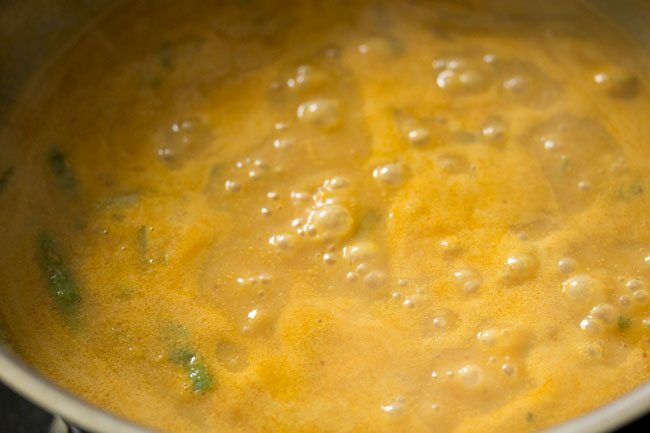 mix the cream very well with the rest of the cottage cheese curry. switch off the flame. 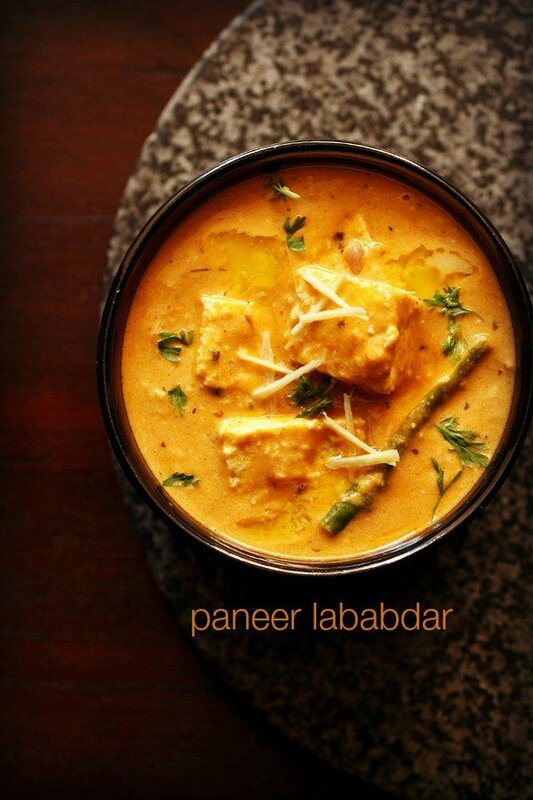 serve paneer curry garnished with some coriander leaves accompanied with chapatis, parathas, naan or steamed rice or jeera rice. you can add less or more of the spice powders, depending on your requirements. less or more water can be added, depending on the gravy consistency you want. this recipe yields a medium consistency gravy. tofu can be replaced with paneer. 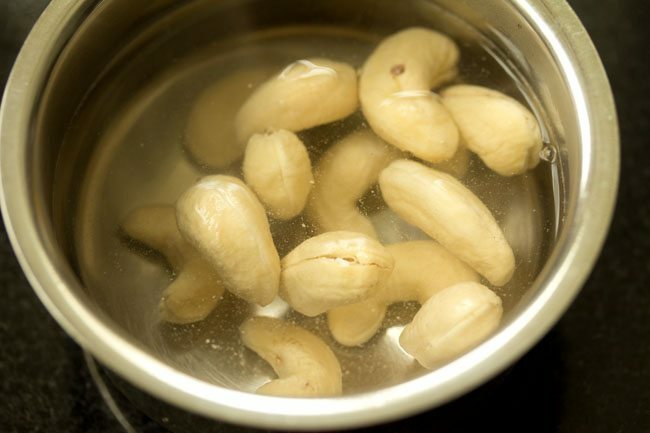 1. first soak 12 to 15 cashews in hot water for 30 minutes. 2. when the cashews are soaking, roughly chop 2 large tomatoes, 1 large onion, 1 inch ginger and 6 to 7 small to medium garlic cloves. crush the ginger and garlic to a paste in mortar-pestle. 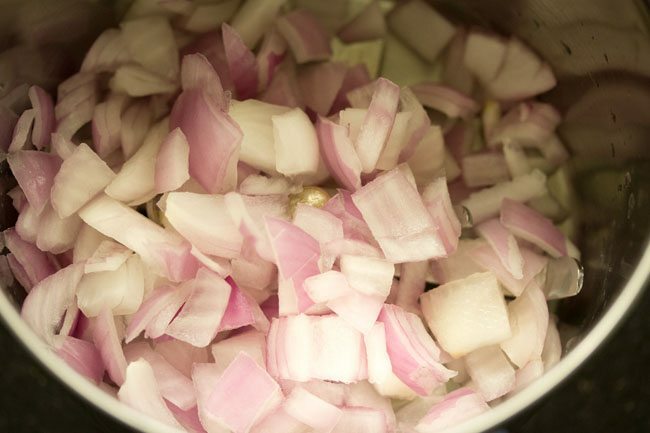 3. in a blender jar or grinder jar, take the chopped onions. 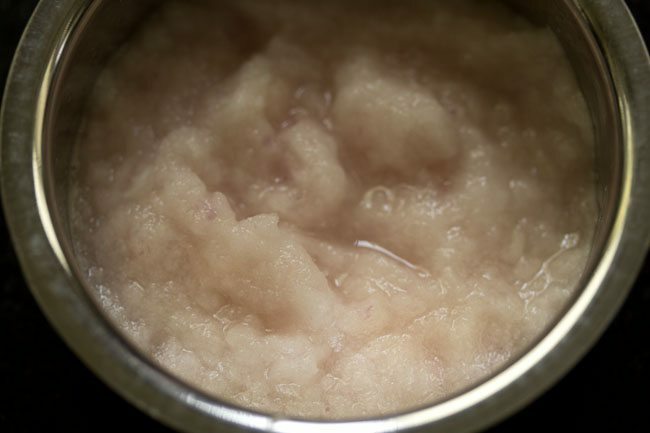 4. without adding any water grind to a smooth paste. remove the onion paste in a bowl and keep aside. 5. to the same grinder jar, add chopped tomatoes. also add the soaked cashews. 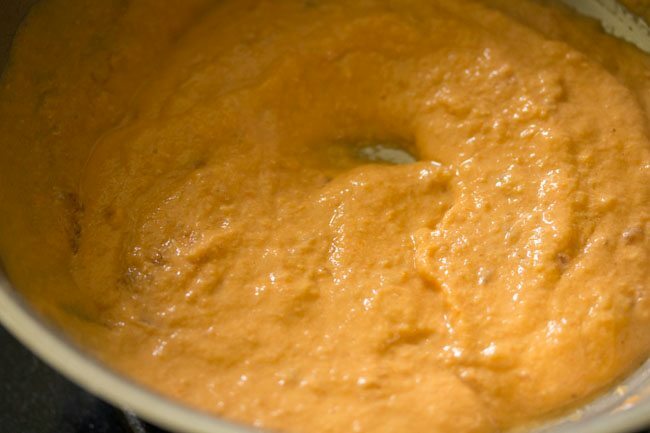 6. again without adding any water, grind both tomatoes and cashews to a smooth paste. keep the jar aside. 7. heat 3 tablespoons oil in a thick bottomed pan or kadai. add the onion paste. 8. on a low flame begin to saute the onion paste. keep on stirring often while sauteing the onion paste. be careful while adding onion paste as it splutters. 9. saute till the onion paste becomes light golden or golden. 10. then add the crushed ginger-garlic paste. 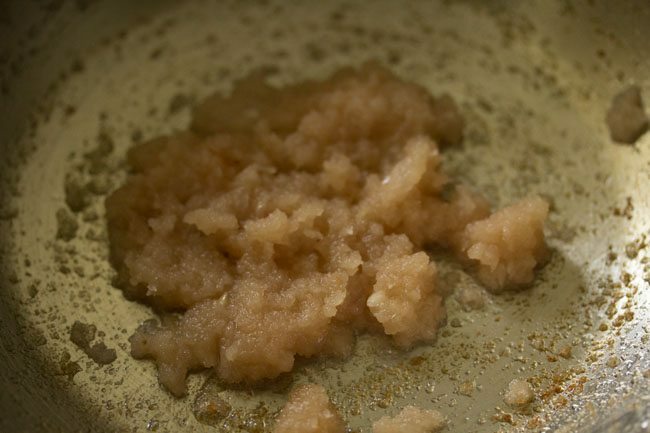 if using ready ginger-garlic paste, then add 1 teaspoon of it. 11. stir and saute till the raw aroma of ginger-garlic goes away. 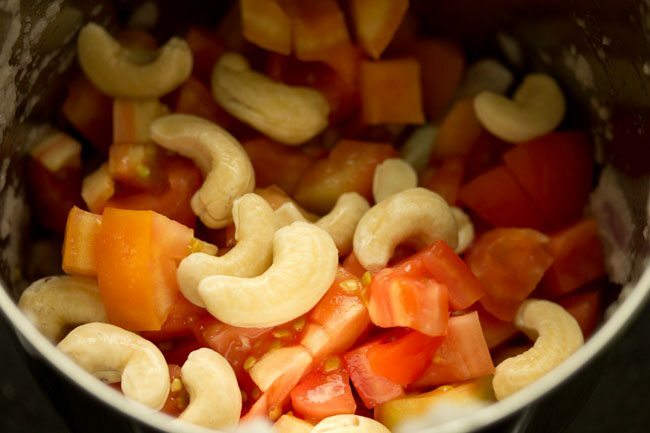 12. now add the tomato+cashews paste. 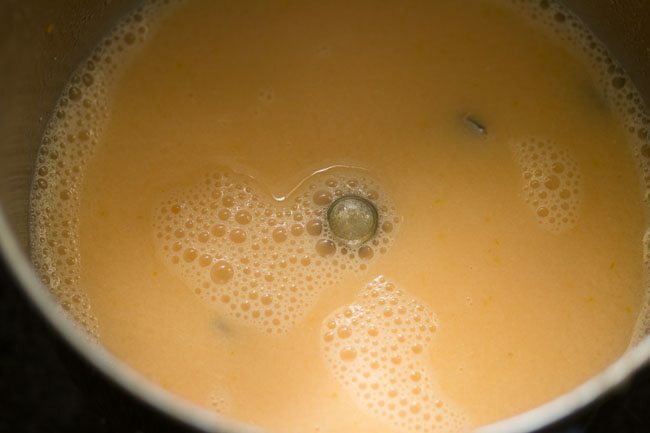 be careful as the mixture can splutter. 13. mix everything very well and begin to saute the masala on a low flame. 14. while the masala is getting sauteed, add 1.5 cups water in the grinder jar. swirl the jar so that the tomato paste at the sides and at the bottom get mixed with the water. if you want you can even run the mixer once, so that everything gets mixed well. keep aside. 15. saute the onion-tomato-cashew masala till you see some fat releasing from the sides. the masala will also become glossy. stir often while sauteing the masala. 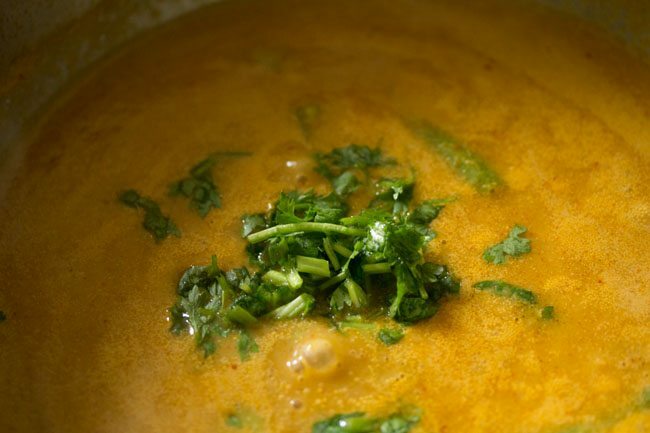 16. then add ¼ teaspoon turmeric powder, ½ teaspoon red chilli powder, ½ teaspoon coriander powder and ½ teaspoon garam masala powder. 17. mix the spice powders very well. 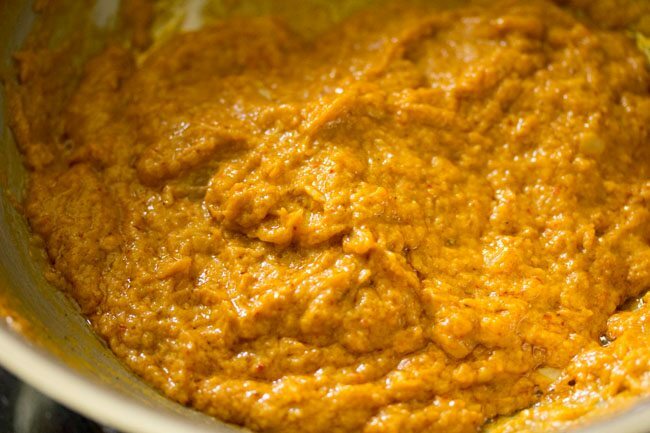 19. add the water which was mixed with the leftover tomato+cashew paste in grinder jar. 21. add 1 tablespoon chopped coriander leaves. 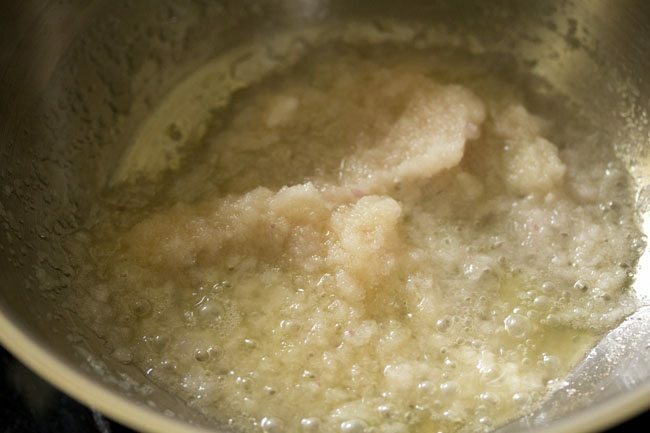 22. on a low to medium flame, simmer the gravy till it thickens a bit and you see oil specks on top. 23. then add paneer cubes. 200 grams paneer which have been cut in cubes or squares. 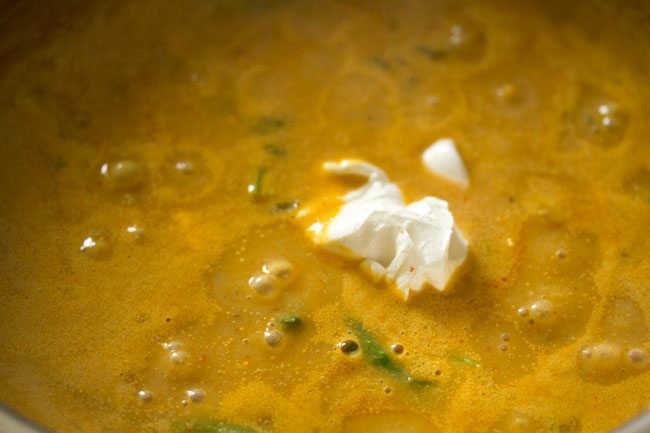 24. add ½ teaspoon kasuri methi, which has been crushed. mix well and cook for a minute. 25. then add 2 tablespoons low fat cream. 26. mix the cream very well with the rest of the cottage cheese curry. switch off the flame. 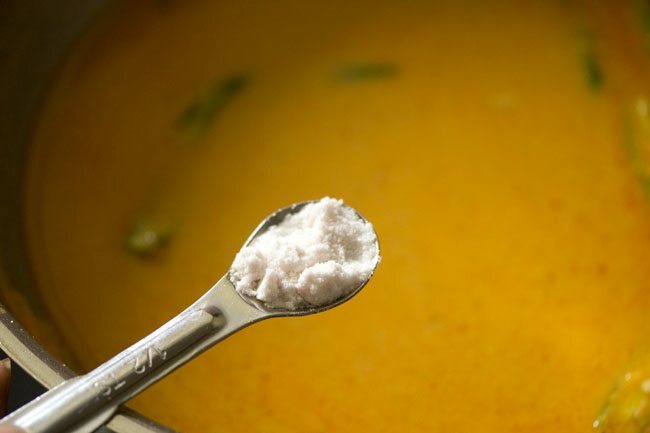 check the taste of cottage cheese curry and add more salt if required. you can also add ¼ to ½ sugar at this step. just mix very well. 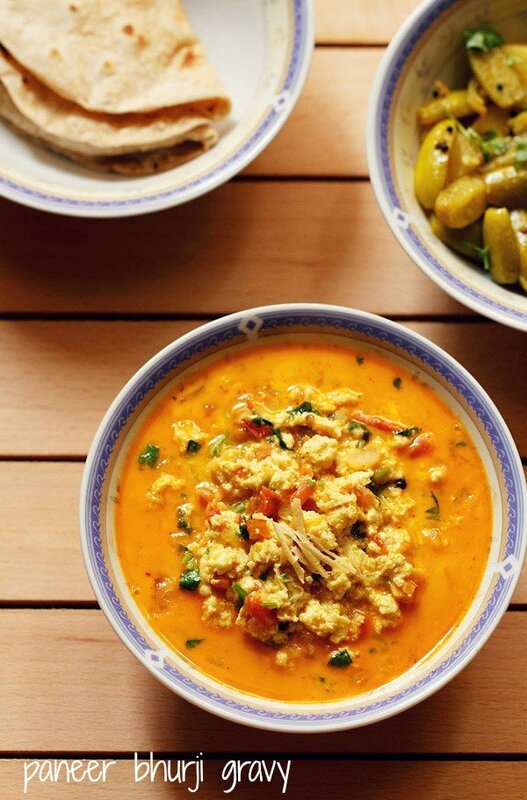 27. serve paneer curry garnished with chopped coriander leaves accompanied with chapatis, parathas, naan or tandoori rotis or steamed rice or cumin rice. thanks a lot ruby both for the feedback and the review. some sugar in tomato based gravies nicely help to balance the tang. usually whenever i make tomato based gravies i add a bit of sugar in the end. most welcome and i am so glad that the website is helping you to become more confident in cooking. i could make out you are from ireland seeing your email id 🙂. wish you all the best and warm regards. yumm! Made it today. Only change I made was no oil. I know it’s horrible to eat such dish without oil, but to take care of my heart’s heart I have to do it this way :(. As I’m new to no oil cooking(not always) I guess I fried onion and tomato little LOT longer. That affected taste but still it was yummy. Thanks! Welcome Prajakta. Good to know that you liked the dish. Take care of your health. Yesterday I tried it was delicious! ( I didn’t add ginger garlic ) but even then it was good thanks for the recipe! Welcome Sravanti. Glad to know this. Sadaf, i am yet to post that recipe. Love your recipes ! Am about to try this and was wondering if I can replace cream with yogurt. Thanks Nupur. I won’t suggest as the dish can become sour. thank you anitha for sharing you feedback and experience. instead of fresh cream you can use malai. 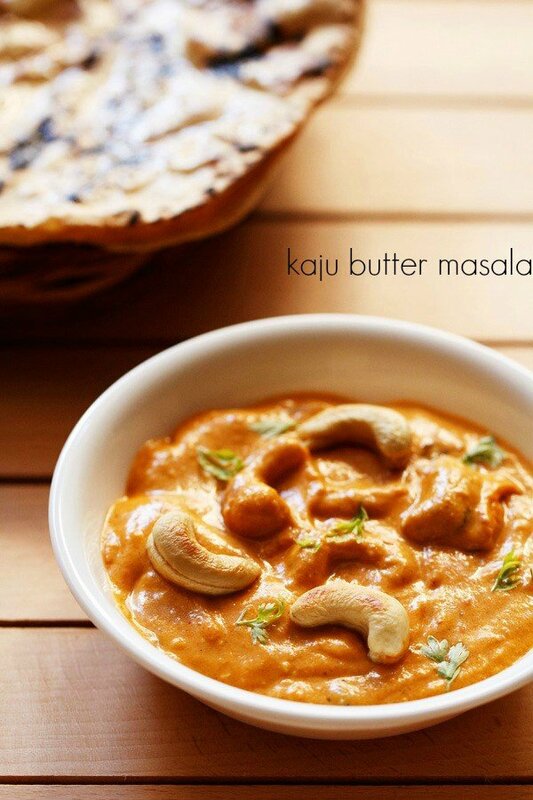 for malai now, two ways you can use it. 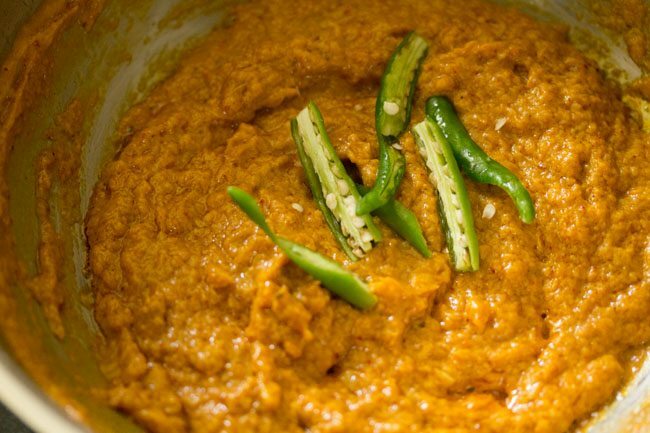 either saute to with onion-tomatoes or you can whip the malai in a small blender or with a wired whisk and then add towards the end once the dish is done. you can also use milk powder. but with milk powder, the gravy becomes sweet. 2 tablespoons of milk powder will make the gravy overtly sweet and there is no balance of flavors in the dish. so with milk powder, some discretion has to be used and it also depends on what kind of gravy base is there. another option is to use cashew paste or almond paste. they give a nice creaminess to the gravy. you can add the paste after the onions and tomatoes are sautéed. a last option is to use khoya or mawa. 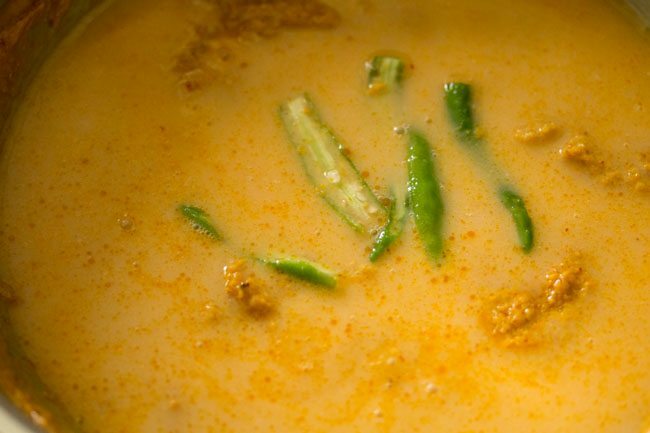 khoya makes the gravy rich but the taste is also good. thanks a lot debashree for sharing this. glad and pleased and also thanks for your kind wishes. Hi author, your recipes are really great. I’m beginner in cooking but with God’s grace your blog is really helpful to me.God bless you..Thank you so much. I need a help, due to doctor’s advice my dad avoid tomatoes and potatoes. There is any tastey dishes without using this????? thanks frednesh. you can skip tomatoes and potatoes in many dishes. even with minimal ingredients, you can make good recipes. on the website i have added many recipes that are made without tomatoes. also of any recipe, if just one tomato is used, then you can easily skip it, eg veg pulao or biryani or any gravy. but in a recipe where more tomatoes are added, then skipping them is not recommended. hope this helps. 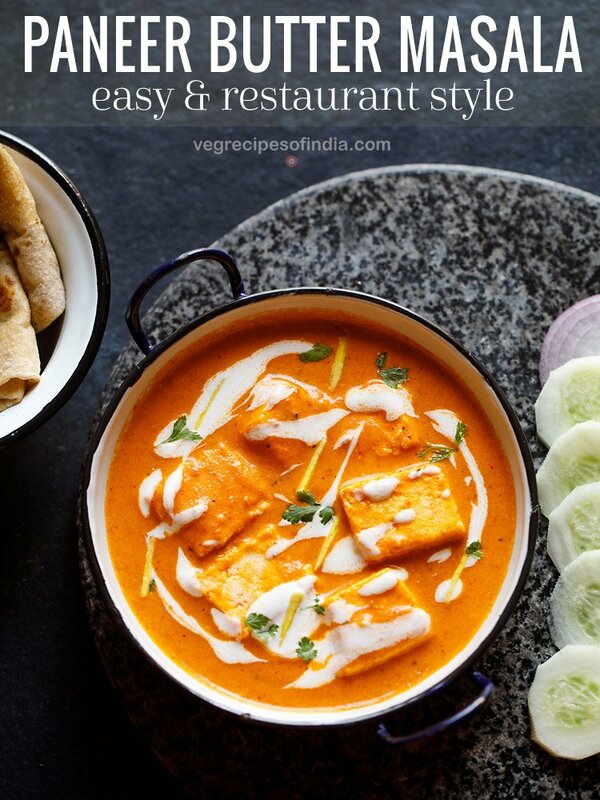 I tried the paneer masala gravy and it was delicious, I wanted to know if I could add capsicum to this recipe? If yes at what stage should I add capsicum? happy diwali archana. 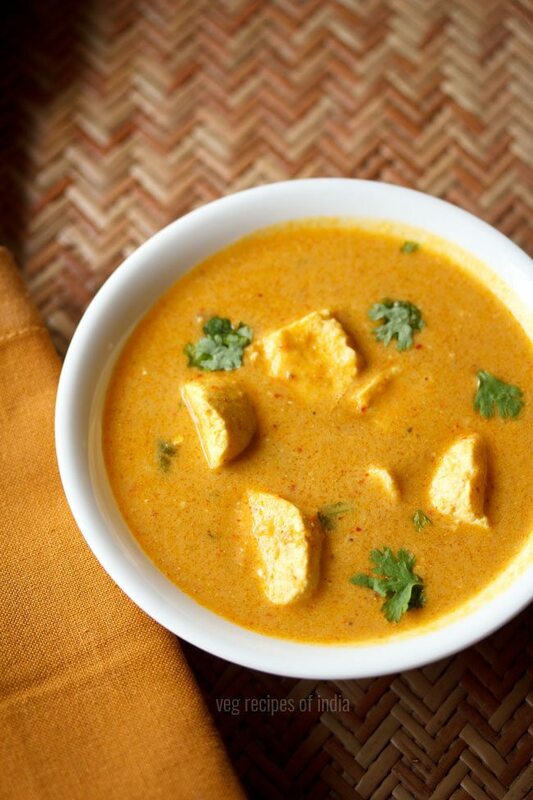 thanks for the feedback on paneer masala recipe. after you add the spice powders in the onion-tomato masala, then you can add the capsicum. just saute for a few minutes after you add capsicum. then add green chilies and water. 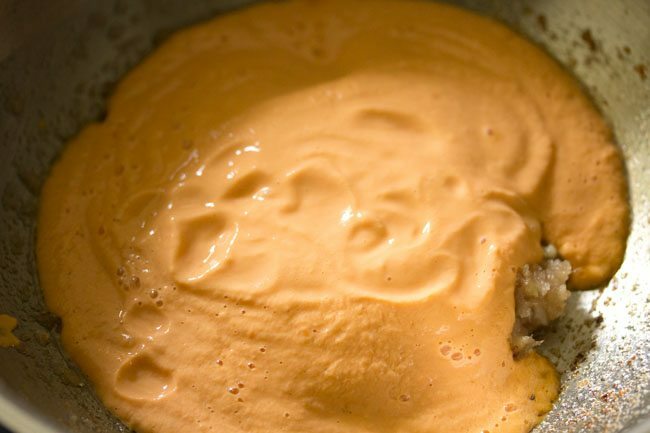 yes… you can thicken the gravy. usually boiled mashed potatoes are added in north indian gravies eg for chana masala or rajma masala to thicken the gravy. 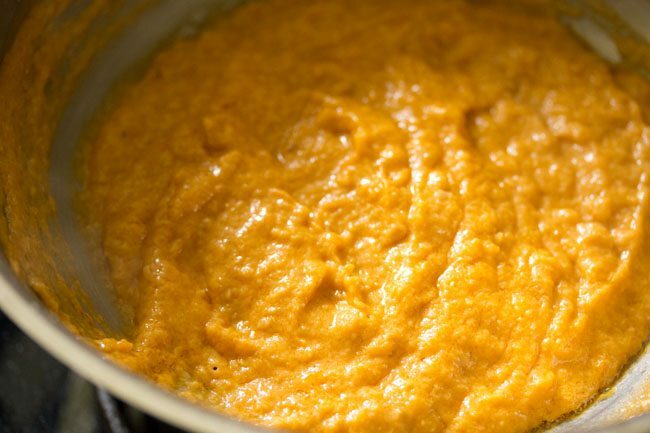 another way is to add a nut paste, like cashew paste or almond paste. even beaten curd can be added. but when adding curd, care has to be taken, so that it does not split. in some recipes even grated or crumbled khoya (mawa) is added. even gram flour (besan) or makki ka atta (maize flour) can be added. but the taste will differ with the ingredient that is added. if you would have just allowed it cook without a lid for some more minutes, the gravy would have reduced in size. thanks archana for the last line. feel nice and i also feel motivated to share more. wish you and your family a happy diwali. I’ve just discovered your blog and I love it! I’ve been in a food mood today. Reading about different dishes, looking up recipes and planning out meals for the week. This blog is very well done. It’s very clear, informative and the photos are beautiful. I believe I’ll try this recipe out first and work my way through your many others. Thanks very much! thanks for your kind words and positive views lee. glad you liked the recipes, layout and pictures of our blog. surely try and do share your feedback with us. you are welcome. Dear dasani, cud u pls inform which garam masala is to b used as I nvr found a specific Punjabi garam masala in any of the branded masala co. So if was to use any ready made one which wud u suggest. neha, you won’t get any punjabi garam masala outside. i do not prefer to use ready made garam masala as i find them too pale and less aromatic when compared to the homemade ones. so i prepare garam masala at home. you can check the recipe links given below and scale down the ingredients and make a small batch. Dear Amit, first of all sry for mentioning ur name incorrectly. Thanks for the reply, I was just willing to confirm that you use some special masala, but it’s the same v prepare at home. Ur site is a great help. The simplicity of ur recipes inspires a lazy person like me to and trust me I hv tried many n the wrk wonder. Ll b waiting for many more easy, simple yet delicious recipes. no issues neha and thanks a lot. will keep on adding more recipes. Thank you Dasani, another hit. What I might try with this next time is shallow the paneer first (like your saag paneer) and use the gravy from your baby corn masala recipe. thank you maffinley. 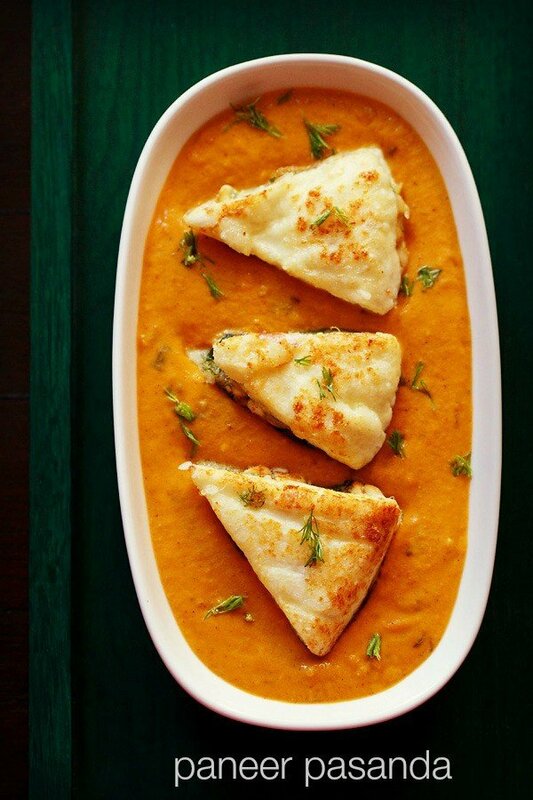 you can definitely fry the paneer and use the baby corn masala gravy. 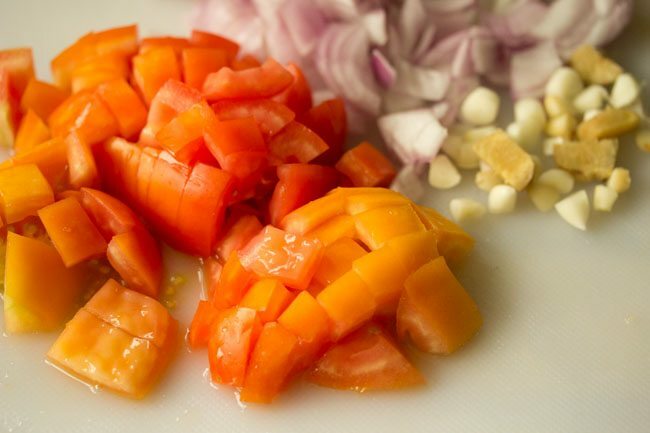 what a coincidence, just yesterday I wished to learn how to prepare this dish… and here comes the recipe. Your blog is amazing. Thank you, I’ll try to cook paneer masala soon!